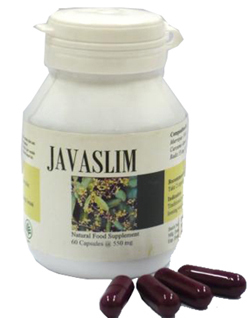 JavaSlim Capsule is specially made to overcome overweight problem. It is formulated from traditional recipe which may help speedily reduce body weight without having to loosen regular meals. It may reduce and tighten large, flabby bellies and eliminates excessive fats. Traditionally used for reducing body fat and loosing weight. Pregnant women and diarrhea sufferer may not take these capsules. Reduce in take of fatty foods & beverages, exercise regularly, eat more vegetables and fruits.